1/ What is transcoding? and what are transcoding credits? Transcoding is the process that allows you to create several renditions of the same video allowing you to offer your viewers different video qualities. Transcoding is also used when the original uploaded format of the video cannot be played. Transcoding credits represents the amount of GB available in your DaCast account to transcode Video On Demand. 2/ When am I using transcoding credits? -Triggering several renditions on your Video On Demand (when encoding your Video On Demand). NOTE: WHEN SELECTING SEVERAL RENDITIONS AS SHOWN ON THE PICTURE ABOVE, YOU ARE ONLY CHARGED FOR ONE RENDITION. -Uploading your Video On Demand with auto encode. 3/ How many transcoding credits do I get? Free trials get 2GB of transcoding credits in order to test the video transcoding feature. You also have the ability to purchase extra transcoding credits if needed. This will be explained on part 5/. NOTE: When triggering your overage storage, DaCast offers you 50% of the overage storage used. 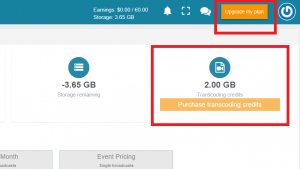 For example: If you used 10GB of overage storage, you’ll receive 5GB of free transcoding credits! 4/ How do I know how many transcoding credits are remaining on my account? 5/ What if I don’t have enough transcoding credits remaining? NOTE: If you are on a free trial, you cannot purchase extra transcoding credits. 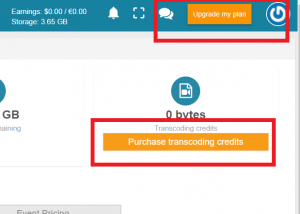 You will need to purchase a plan before purchasing extra transcoding credits.